This charming one-bedroom unit on the ground floor is located right at the foot of the Le Soleil ski trails and ski lift. This is an attractive, well-equipped and comfortable condo in a peaceful location. All the essentials are included. All you have to do is drop off your bags. 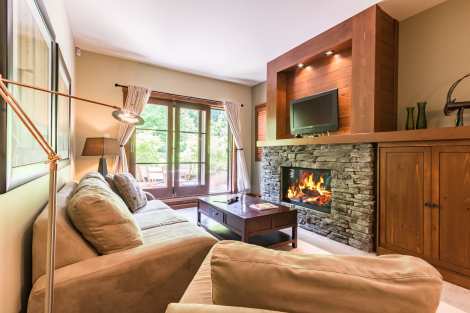 The pleasant main room includes a modern, well-equipped kitchen, a large dining table, a cozy living room with gas fireplace and a large glass door that opens onto the patio. The bedroom is nicely furnished with a cozy king-size bed that's perfect for a great night's sleep and has direct access to a full bathroom. A flat-screen TV and wireless high speed internet are included. During the summer, we love spending time on the pretty patio with barbecue or cooling off in the air-conditioned interior.